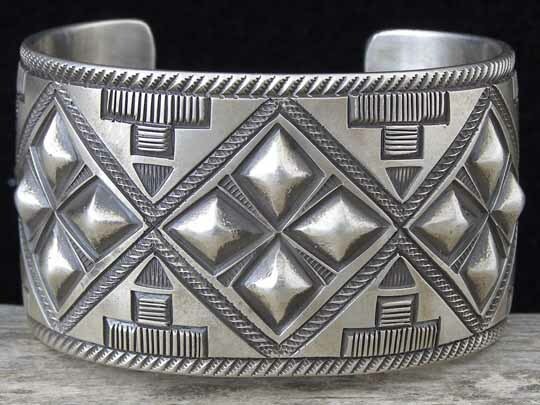 Calvin Martinez Deep-Stamped Sterling Ingot Bracelet size 7"
Regular visitors to our website know that Calvin Martinez is one of our preferred silversmiths. This is why we actively seek his work. It's not simply his exquisite workmanship which dazzles us, it's also his ability to design pieces in a wholly traditional style while inventing those very designs. The style of work that Calvin does is commonly referred to as Traditional Revival. But in Calvin's case, this does not merely equate to reviving older designs; he's got the Traditional Muse on his shoulder and invents new designs which look 75 or 100 years old. This stunning bracelet is made from ingot silver and impeccably stamped with Calvin's handmade stamps and punctuated by repoussée diamonds. Beautifully handmade and, of course, one-of-a-kind. This is a uniform-width cuff. Hallmarked C.MTZ inside an arrowhead and stamped Navajo and Sterling inside. Width of cuff: 1 1/2"